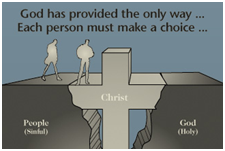 Tract – Jesus is the Bridge to God | I Want to Witness, But What Do I Say? Step 4- Our Response-Receive Jesus Christ We must trust Jesus Christ as Lord and Savior and receive Him by personal invitation thru a Salvation prayer. Type in your name and your e-mail address below and a download link for this Tract will be sent to your inbox for FREE! If you do not see it at first in your Inbox, please check your spam folder. This download is free, but I wanted to give you an opportunity to give if you would like to, so we can do more to spread the gospel. Galatians 6:7 says “whatever a man sows, that he will also reap.” PayPal’s website is safe, secure and encrypted.